REC (Rajkiya Engineering College) Has Released Recruitment Notification For 103 Teaching, Non Teaching Posts. All Eligible & Interested Candidates Can Apply Online.Further Detailed Information Regarding Educational Qualifications, Age Limit, Selection Procedure, Exam Pattern, Syllabus for REC (Rajkiya Engineering College) Recruitment 2017 - 103 Teaching, Non Teaching Post is mentioned below. Pay Scale - Rs. 15,600 - 39,100/- With 6600/ 5400/- Grade Pay (Non-Teaching), Rs. 9300 - 34,800/- With 4600/- Grade Pay (Non-Teaching), Rs. 5200 - 20,200/- With 2800/2000/1900/- Grade Pay (Non-Teaching) . How To Apply - All Eligible & Interested candidate fill the on-line application through official web-site (http://www.reckannauj.in). After successfully submitting the application, candidate must send by hard copies of application a long with relevant testimonials to the following Address before / (8th June 2017). Address -Director, Rajkiya Engineering College Kannauj, at Harcourt Butler Technical University Campus, PO-Nawabganj, Kanpur-208002 (U.P.) . Opening Date of Online Submission of Application Form Is - 19-05-2017. Last Date of Online Application Is- 08-06-2017. Last Date to Submit Hard Copy of Application Form Is- 15-06-2017. Click Here For REC Recruitment 2017 Detailed Advertisement 1. Click Here For REC Recruitment 2017 Detailed Advertisement 2. REC (Rajkiya Engineering College) Has Released Recruitment Notification For 110 Teaching, Non Teaching Posts. All Eligible & Interested Candidates Can Apply On-line. Further Detailed Information Regarding Educational Qualifications, Age Limit, Selection Procedure, Exam Pattern, Syllabus for REC (Rajkiya Engineering College) Recruitment 2017 - 110 Teaching, Non Teaching Post is mentioned below. Pay Scale - Rs. 37,400 - 67,000/- With 10,000/9000/- Grade Pay (Post 1,2), Rs. 15,600 - 39,100/- With 6000/- Grade Pay (Post 3,4,13-15), Rs. 9300 - 34,800/- With 4600/4200/- Grade Pay (Post 5,7,8,16,18,21,22), Rs. 5200 - 20,200/- With 2800/1900/- Grade Pay (Post 6,9-12,17,19,20,23-27) . How To Apply - All Eligible & Interested candidates may fill the on-line application through official web-site (http://braecit.ac.in). After successfully submitting the application, candidate must send by hard copies of application a long with relevant testimonials to the following Address before / (5th June 2017). 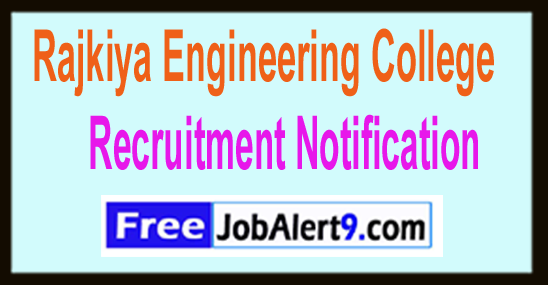 Address -Director, Rajkiya Engineering College, Atarra, Banda-210201 (U.P.) . Commencement of Online Application Form Is - 14-05-2017. Last Date of On-line registration - 05-06-2017. Last Date of Receipt of Applications - 11-06-2017.